Pleading the Sixth: Felony defendants throughout Mississippi are arrested and then routinely wait from typically two months to up to a year before a lawyer begins working on their behalf. When a felony lawyer is finally appointed, the attorney is too often under-resourced, overworked, and financially conflicted between working on behalf of the defendant’s legal interests and doing what the attorney needs to do to please the judge to secure the next contract or appointment. With the situation so dire, why then is the 6AC optimistic that change is finally coming? In United States v. Cronic, the U.S. Supreme Court said, “the adversarial process protected by the Sixth Amendment requires that the accused have ‘counsel acting in the role of an advocate.’” Yet the vast majority of indigent persons accused of felony crimes in Mississippi never have an attorney working on their behalf prior to their arraignment in circuit court. Instead, during the entire period between a felony arrest and the arraignment on indictment, indigent felony defendants fall into a “black hole” in which they are not represented by an attorney. 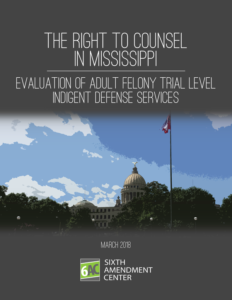 This is the principal finding of the Sixth Amendment Center’s new report, The Right to Counsel in Mississippi: Evaluation of Adult Felony Trial Level Indigent Defense Services, released March 19, 2018, that assessed services in ten local jurisdictions (Adams, Clarke, DeSoto, Forrest, George, Harrison, Hinds, Leflore, Lowndes, and Pearl River counties). The Justice’s words underscore the seriousness with which state policymakers and criminal justice actors are taking the new report, which was commissioned by a legislative task force and funded through a U.S. Department of Justice, Bureau of Justice Assistance grant. Indeed, the Task Force is already working to determine the most appropriate way to promulgate, monitor, and enforce uniform right to counsel standards in a way that accommodates the unique procedures and substantive law of the state, is fiscally responsible, and protects public safety. 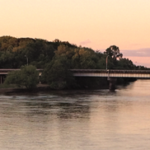 “I have been extremely impressed with the seriousness with which the Task Force undertook their mission and have no doubt that its members will continue their hard work to rectify these issues,” stated 6AC Director David Carroll upon the report’s release. Unlike many states where municipal courts only hear local ordinance violations, Mississippi’s 246 municipal courts adjudicate misdemeanors and hold initial and preliminary hearings on felonies. This makes cities and towns responsible for much of the cost of right to counsel services initially, and then after felony preliminary hearings the full cost of felony defense is borne by Mississippi’s counties. Local governments, however, have significant revenue-raising restrictions placed on them by the state, while being statutorily prohibited from deficit spending. There are three revenue sources available to local governments: real estate taxes; fees for permits and services; and assessments on ordinance violations, traffic infractions, and criminal convictions. But, because Mississippi limits the amount of property tax that counties can impose, local governments must rely more heavily on unpredictable revenue streams, such as court fees and assessments, to pay for their criminal justice priorities. It comes as no surprise then that there is wide inconsistency in how indigent defense is provided across the state. Mississippi requires that counsel be provided either through a public defender office or through appointment of individual private attorneys. Whichever system is used, the circuit court judges presiding in a county select the attorneys who represent indigent people charged with felonies, within the budget allotted by the county board of supervisors. In those counties that have established a public defender office, the circuit or senior circuit judge selects an attorney to serve as the full-time or part-time public defender. Only seven of Mississippi’s 82 counties have established full-time public defender offices, including Forrest, Harrison, Hinds, and Pearl River, all of which were studied closely for the evaluation. Where the county board of supervisors does not establish a public defender office or when the public defender office has a conflict of interest, the circuit court judge appoints an individual attorney to represent an indigent defendant charged with a felony. The attorney is paid out of the county’s general fund. The court may approve compensation in whatever manner (hourly rate or fixed fee) and at whatever amount the appointed attorney is willing to accept, but the maximum amount that an attorney can be paid for a single felony case is $1,000 plus reimbursement of actual expenses. Only 12 counties in the state, including Leflore, provide representation to indigent felony defendants exclusively through appointed private attorneys who are paid an hourly rate. The remaining 63 counties, including Adams, Clarke, DeSoto, George, and Lowndes, provide the right to counsel through appointed private attorneys who are paid a fixed fee to represent an unlimited number of indigent felony defendants. When a person is suspected of a felony offense in Mississippi, he will be arrested. Every person arrested on a felony charge in Mississippi has a right to an initial appearance before a judge within 48 hours, unless the defendant has been indicted by a grand jury or is released from custody prior to the initial appearance occurring. A defendant who is arrested for a felony and who has not been indicted by a grand jury is entitled to have a preliminary hearing. The preliminary hearing is a critical stage in a criminal case at which the indigent defendant has a right to counsel. Only a very small percentage of indigent defendants who are arrested on a felony in Mississippi ever have a preliminary hearing, because as a practical matter, the scheduling of a preliminary hearing is treated as a triggering mechanism to have some attorney present in court to represent an in-custody felony defendant for the limited purpose of securing a bond reduction. In all ten of the studied counties, felony defendants are almost always offered and accept a bond reduction in exchange for waiving their right to preliminary hearing. For the small number of indigent felony defendants who actually have a preliminary hearing, in only two of the ten counties will the attorney who represents an indigent felony defendant at a preliminary hearing conduct any investigation to prepare for the hearing. Indigent felony defendants usually meet their preliminary hearing attorney for the first time at the courthouse on the day of the hearing for a brief 5- to 10-minute conversation. In most of the studied counties, the attorney appointed to represent an indigent felony defendant at a preliminary hearing is not, other than through coincidence, the attorney who will represent the defendant following any indictment subsequently returned by a grand jury. Once a preliminary hearing is either waived or held, an indigent felony defendant in the ten closely studied counties is not represented by any lawyer until arraignment in circuit court after a grand jury indictment. The Mississippi Constitution requires that felony prosecutions be instituted by a grand jury indictment. A large amount of time can pass between an indigent felony defendant being arrested and/or bound over and a grand jury returning an indictment, and Mississippi law does not impose any limits on the amount of time that is allowable. On average, the delay between arrest and grand jury indictment in the ten studied counties ranges from two months to over a year. The 6AC has written extensively about the preeminent need for a public defense system to ensure the independence of the lawyers from undue judicial interference. Far from ensuring that independence, the State of Mississippi statutorily imposes undue judicial interference with the right to counsel for indigent defendants. It does so in two primary ways: by requiring judges to hand-select the attorneys who are paid to provide representation to indigent defendants, rendering the defense attorneys beholden to the judge for their livelihood; and by allowing judges to enter into payment agreements with indigent defense attorneys that create a conflict of interest between the defense attorney’s financial self-interest and the criminal case interests of the indigent defendants whom they are appointed to represent. Attorneys in judicially controlled indigent defense systems often, consciously or unconsciously, follow or adjust to the needs of each judge in each court, rather than focus on providing constitutionally effective services for each and every defendant. Fearing the loss of their job if they displease the judge who hires them, defense attorneys bring into their calculations what they think they need to do to stay in the judge’s favor. When public defense attorneys take into consideration what must be done to please the judge in order to get their next appointment or hold on to their contract, by definition they are not advocating solely in the interests of the client, as is their ethical duty. In counties with a public defender office, the judges are supposed to choose the public defender from a list of attorneys recommended by the local bar association, but in the counties studied for this report, there was no indication that judges follow this direction. The designated public defender is statutorily authorized to choose the assistant public defenders, but in only two of the four public defender offices evaluated in this study does the public defender select the assistant public defenders independently of the judges. Thus, even where the legislature has attempted to impose a degree of independence from the judges in selecting attorneys to represent the indigent accused, this is rarely occurring in practice. In counties where private attorneys are appointed, the circuit court judges by and large decide how much money the attorneys will be paid to represent indigent felony defendants. Where judges choose to pay attorneys an hourly rate, because an attorney cannot be paid more than $1,000 in a single defendant’s case, the number of hours an attorney will devote to each indigent defendant’s case is determined by the hourly rate of pay set by the judges. For example, if the judges set pay at the relatively high rate of $100 per hour, the attorney cannot be paid for any more than 10 hours of work in a single case, no matter how many hours a client’s legal interests require. If the attorney devotes even a single minute more than 10 hours, he is donating his time for free to represent the indigent defendant. Once the attorney reaches the number of hours for which he can be paid, a capped hourly rate creates an incentive for the attorney to rush a client to plead guilty without regard to the facts of the case, avoid conducting investigation or legal research, and avoid engaging in hearings or a trial. Additionally, because an attorney can earn up to $1,000 for each appointed case, it is in the attorney’s own financial interest to accept as many appointed cases as possible without regard to the attorney’s ability to provide effective assistance of counsel to each individual indigent defendant. In eight of the 10 counties studied closely in this evaluation, some or all of the attorneys appointed to represent indigent felony defendants are paid capped hourly rates that create a conflict of interest between the attorney’s own financial interest and the legal interests of the indigent defendants whom the attorney is appointed to represent. Where judges choose to pay attorneys a fixed fee, the attorney is responsible for representing an unlimited number of indigent felony defendants in return for a certain amount of money. Because an attorney is paid exactly the same amount no matter how few or how many cases he is appointed to handle, and no matter how few or how many hours he devotes to each case, it is in the attorney’s own financial interest to spend as little time as possible on each defendant’s case. For example, if an attorney is paid $24,000 a year to represent indigent felony defendants, and if his indigent felony cases take up all of his available working hours, then that attorney cannot earn more than $24,000 in a year. On the other hand, if this attorney devotes only half of his working hours to his indigent clients, then he can spend the other half of his working year on more lucrative paying cases or other employment, thereby greatly increasing his annual income. A fixed fee creates incentives for the attorney to rush a client to plead guilty without regard to the facts of the case, avoid conducting investigation or legal research, and avoid engaging in hearings or a trial. It also incentivizes the attorney to favor the legal interests of his paying clients or other employment over the legal interests of the indigent defendants he is appointed to represent. The situation is worse yet if the attorney is not reimbursed for overhead and case-related expenses. In our example, this means any resources devoted to an indigent defendant will come out of the attorney’s $24,000 compensation. This creates a disincentive for the attorney to, for example, hire an investigator or experts, accept toll calls from a client in jail, or incur any overhead costs that benefit indigent defendants (such as secretarial time, legal research capability online or through books, or malpractice insurance), without regard to whether the resources are necessary to provide effective representation. Fixed fees create a conflict of interest between the attorney’s own financial interest and the legal interests of the indigent defendants whom he is appointed to represent and also create a conflict between the legal interests of an attorney’s paying clients and those of his indigent clients. Yet throughout Mississippi, this is the method predominantly used to pay the private attorneys who are appointed to represent indigent felony defendants. Providing the Sixth Amendment right to effective counsel is a state obligation under the due process clause of the Fourteenth Amendment. When a state chooses to place this responsibility on its local governments, then the state must guarantee that the local governments are not only capable of providing adequate representation, but that they are in fact doing so. The State of Mississippi currently has no method of ensuring that its local governments meet the state’s constitutional obligations and, for the most part, has not established any statewide standards for the provision of Sixth Amendment right to counsel services in its trial courts. This systemic lack of accountability pervades not only Mississippi’s indigent defense systems, but its broader criminal justice system as well. That a Task Force made up of representatives of all three branches of state government, the Mississippi Bar, the Association of Supervisors, Circuit Judges, prosecutors, and defenders commissioned this evaluation is an indication of the level of cooperation with which the work was conducted and of how improvements can be achieved. Throughout the country, there is a growing consensus that the answer to every government problem cannot be to simply increase spending. And, simply increasing funding for indigent defense in Mississippi would do nothing to alleviate the systemic pressures caused by intertwining aspects of law enforcement, prosecution, defense, and adjudication. One area of discussion needs to be how best to decrease the need for indigent defense attorneys in the first place. The Sixth Amendment right to counsel attaches only to those criminal and delinquency cases where the defendant faces loss of liberty. A concerted effort focused on increasing diversion out of the criminal justice system entirely for appropriate offenses and offenders and on reclassifying appropriate petty and/or regulatory offenses to non-jailable violations are just two methods that should be considered. A state-level entity to promulgate standards that define how effective indigent defense services are to be provided, including at minimum: attorney qualification standards; attorney performance guidelines; attorney supervision protocols; time sufficiency standards; continuity of services standards whereby the same attorney provides representation from appointment through disposition; client communication protocols; and data collection standards. An entity to train criminal justice system actors about the requirements of the standards, so that they are implemented effectively and efficiently. While the standards must be the same statewide, implementation should allow for variations that accommodate local circumstances. A state-level entity to monitor and enforce compliance with standards throughout the courtrooms of the state.